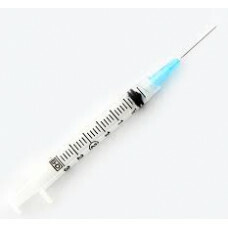 BD 309571 Disposable 3mL Luer-Lok Syringes with 23g x 1"L PrecisionGlide™ needle combination. Needle is detachable. These syringes feature a clear barrel with bold scale markings, tapered plunger rod for ease of aspiration, positive plunger rod stop, and an added BD Luer-Lok tip connection. Packaging is clearly labeled latex free.